There are a few phrases and mantras that are commonly used around the Sky organization by players, coaches, and front office members alike. They are: “next man up”, “trust the process” and “play your role.” One player on the Sky, in particular, knows these words all too well, and that is Cheyenne Parker. 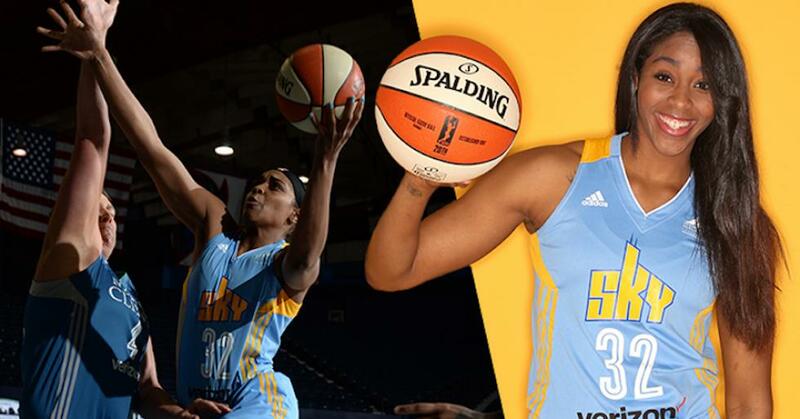 In 2015, Parker joined an already loaded Sky front court that included 2015 WNBA MVP Elena Delle Donne, veterans Erika de Souza, Jessica Breland, Tamera Young and Clarissa Dos Santos. So minutes, as expected, would be hard to come by, not to mention battling it out with fellow rookie Betnijah Laney. “I didn’t really have any expectations. I was just excited to be a part of the team and have this opportunity,” said Parker on her expectations when coming into the league. With every experience though, comes an opportunity to learn. That is exactly how Parker approached the situation. “The thing I needed to work on coming in was just having patience, poise, and confidence in myself,” she explained. Parker did not post any gaudy rookie numbers, but that was not expected of her seeing as there was a major logjam of talent at the forward position. She was in the fortunate position to have time to develop her game, pinpoint the areas that needed improvement and really work on them. So Parker set off for the Far East to play for Henan Yichuan in the Women’s Chinese Basketball Association this past offseason. “When I was overseas, the biggest thing I focused on was intelligence with the ball. I had a lot more opportunities there to get the feel of the ball and being in the game. That allowed me to practice having that mental focus of just slowing down,” Parker said. To say she was more focused while playing overseas is an understatement. Parker led the league in rebounds with 14.1 per game, and finished top three in scoring and blocks at 26.1 points per game and 1.5 blocks per game. Parker returned to the Sky for training camp in April 2016 a renewed and reenergized player, showing tons of confidence. Head Coach Pokey Chatman knew she had a talented player in Parker, so she gave Parker an increased workload to start the season. During May, Parker came off the bench for the Sky, averaging 11.4 minutes, while contributing 3.4 points per game as well as 3.4 rebounds per game. Yet, the Sky still sported a deep front court, which got even deeper with the addition of rookie center Imani Boyette. With the emergence of Boyette, Parker’s minutes and production dipped in June, as she only played an average of 4.8 minutes in five appearances. “Like [Head Coach] Pokey [Chatman] always says, ‘trust the process,’ so I patiently waited,” Parker said. And that patience finally paid off in July. Her average minutes played jumped to 17.4 in seven appearances while adding 5.5 points per game and 4.2 rebounds per game. Of the seven appearances, four of them were starts. As a starter she has played even better, averaging 8.5 points per game and 5.2 rebounds per game in 22.5 minutes per game. In that same span as a starter Parker recorded her first double-double as Sky against the Seattle Storm on July 17 at Seattle, posting 15 points and 10 rebounds. Parker suffered a sprained ankle early in the Sky’s victory against the Phoenix Mercury on July 19, two games before the Olympic Break. Naturally, Parker has used this time to recover, “I’m looking at coming back stronger, faster and better than before. I’m looking at this time to just show what I always had,” she enthusiastically said. Parker personifies was it means to be a professional. When called upon, Parker has stepped up and delivered in a big way. She now forms one of the youngest and most exciting front court tandems in the WNBA with Boyette. Something that should have Sky fans very excited for the sprint to the playoffs and years to come, and something that the rest of the WNBA season.